Libraries have a number of rooms or spaces, even desks/carrels that they'd like to make available for reserving. The main concern is always, how do we make it easy to do but enable restrictions so that people don't just set up shop and start forwarding their mail? LibCal makes the process of setting up the rooms/spaces and creating rules... painless. Create Groups: Private Rooms, Quiet Rooms, Conference Rooms, Auditoriums, Classrooms, etc. Restrictions: Make your decisions about confirmation and when they must cancel by and regarding multiple time slots and consecutive bookings, etc. Mediation: Route some rooms through a librarian-approved mediation process while others remain un-mediated. 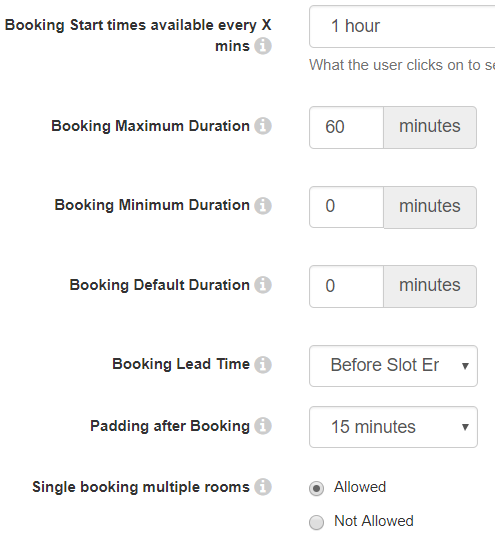 Details: Use customize booking forms, upload a room picture, and organize rooms by capacity. Rooms: Add the rooms with their capacity. Add images and instructions, and establish availability. Stats: Get detailed stats and see how your library is being used, when, and by whom. Your patrons can book a library space on a desktop, laptop, tablet, or smartphone. It's even possible to integrate with Digital Signage inside your library.